Sometimes one gets an opportunity of a holiday and grabs it because it is a cheap offer. I had done it once and had a lesson of life time. I had left my kids with their studies and went on a trip with my dear wife to Singapore with just the airline tickets of to and fro. I had heard of little India and I had thought of bargaining a cheap hotel there. I succeeded in my goals but missed my children there. Then only we decided we will plan a proper tour with our children always. We didn't enjoy because of lack of presence of our children. Their memory pinched us everywhere. Then we planned a grand trip with our kids. This time we didn't want to roam searching for Hotel in an unknown land and be turned down saying "sorry sir, we are full." and spend precious time in haphazard manner. Somethings are learnt in life the harder way and I write this so that reader friends too understand the perils of unplanned holiday trips as well and trying a go by leaving kids behind. Each and every moment passes like an eternity without kids to share the adventures and scenic beauties at far away holiday rendezvous stations. Once you leave them behind that whole tour gets spoiled and jeopardised. Prudent people can understand what I am pointing at in earnest. Life lessons are learnt the harder way. I am not describing my woes. just an eye opener for dear mates. I will try to be as concise as possible. So bear with me friends. So, this time everything was planned thanks to a friend who was a club Mahindra member. 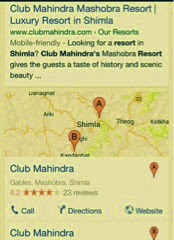 He got us booked at Club Mahindra Resort Hotel at Mashorba, Shimla hills. One great thing that happened was that at the last day we all were filled with heavy hearts and kids wanted to stay just one more day. Despite being full on bookings they somehow managed to extend our stay for another day. How much overjoyed kids were to hear of their affirmative response by their Manager. I understood they keep themselves prepared for any last minute emergencies. Club had gym and spa as well. Here we worked out and relaxed. Jam-session with D.J. to dance to the music. It was their immaculately planned endeavor to make the stay of tourists a memorable one. We saw the sparkle in eyes of our kids. We got more than we had dreamed of. The kids, so very much enjoyed playing games with tourist kids staying there at Club Mahindra itself. We wanted the day to pass slowly, but alas! It flied away. Soon we returned with pleasant memories to cherish leaving our hearts behind. I will always remain indebted to my friend who had showed me the right path towards planning an enjoyable holiday trip. Of all the tours I took, the one at Club Mahindra Resorts was the super best. This post has been written for Happy hour at Indiblogger by Club Mahindra.